Who can forget their first rainbow trout? Yes, I am a preacher, but this is not an article about Noah, the Flood, and the rainbow God set in the sky. Instead, it’s a brief article about how older anglers can introduce youngsters to fishing. In the process, we can help secure the future of a great pastime and encourage our boys and girls to get outdoors. Small actions today can have a big impact tomorrow. I was quite young, no more than 5 or 6 years old because we were still living in our little two-bedroom house on West Thorain. My parents decided to take my sister, Marilyn, and me to the annual Sport & Boat Show in downtown San Antonio for some inexpensive entertainment. The convention hall, I remember, was filled with boats and motors, all sizes and kinds. But the part of the show that interested me most was the rainbow trout tank. I remember that a rectangular plastic “pond” was filled with stocker ‘bows and people were fishing all around the edges with these little rods. “Mama, Daddy, can I try? Can I? Do we have enough money? I brought my quarter!” Mom and Dad looked at one another, and I was thrilled to see the “yes” in their eyes. So I bought my ticket, grabbed a rod, and started fishing as hard as I could. The fish were right there. Why couldn’t I catch anything? The frustration rose in my throat and filled my eyes with tears. And then a magical thing happened. One of the men who ran the exhibit saw me, felt my hurt, watched as I tried again and again . . . and decided to do something about it. I saw him wink at my dad. What did that wink mean? He put his hand on my shoulder and said, “Son, try this rod. We’ve had good luck with it today.” Looking back on it, I’m sure it had a worm, or corn, or some kind of bait besides the little artificial flies everyone else had on their rods. I dipped the line in the water and . . . WHAM! . . . I couldn’t believe it! A rainbow trout struck hard, and I held on. I’m sure the rainbow was three feet long—well, that’s how I remember it. I landed that fish, and the man even cleaned it for me, put it in a bag of ice, and we took it home. I remember that Mama cooked it for me as soon as she could fire up the stove. No fish ever tasted sweeter or was better remembered. In my mind I can still see that first rainbow, hear the man’s gentleness, feel that tug, thrill to the splash of water. I remember the kindness of my parents who allowed the opportunity in the first place, even when money was tight. I’m 58 years old today, and that experience has stayed with me for more than five decades. Mom and Dad are gone, but the memory remains. Can anyone guess what my favorite fish is to this day, even though I still live in San Antonio, Texas? I’ve never fished for wild trout, though I’d love to do that some day. 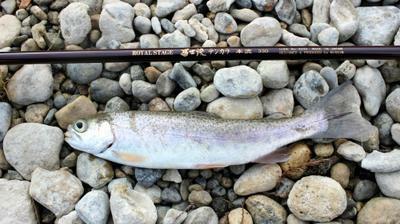 But each winter I tenkara and keiryu fish for stocker rainbows in the area rivers, and the excitement has never left. I can’t explain the wonder I feel when a rainbow strikes. It stirs emotions inside me that words can’t tell. I’m that little boy again. I don’t think that wonderful man at the trout tank told us his name. Frankly, I can’t remember exactly how he looked. But I do remember what he did, and I hope I can have the same impact on a young person’s life. I know that Chris Stewart offers some wonderful starter rods and kits just made for children. It’s hard for me to imagine a better gift. There’s so much that’s unwholesome and unhealthy in this world. Shouldn’t we try to replace a little of the bad with the good and be a spark for someone? Who knows, you just might change a five-year-old’s life. John, thanks for the great story. I too am a minister (25 years as a medical chaplain). Yesterday was my younger brother's birthday. He died a tragic death 6 years ago. I helped him catch his first fish by himself at 4 years old. It was a nice pumpkin seed sunfish. He was a passionate fisherman. I am a twin. One problem with being a twin is always doing things with your brother. One of my fondest fishing memories is my Dad taking me when I was 4 years old out to East Turtle Lake to teach me how to fish. My brother Wes kept insisting on going. My Dad said, No, "this is my special time with Les to teach him how to fish." I learned how to tied my own hook on the line. I learned how to put the worm on the hook. I learned how to put the bobber on the line and cast it out. I learned how to set the hook and land my own fish. I am 64 years old, and that was just shy of 60 years ago, and I can still see that silver crappie coming up from the depths after an exhilarating fight on my Zebco closed face spinning rod that my Grandpa had given me for Christmas. I can still see the smile on my Dad's face and hear the chuckle of satisfaction that his son caught his first fish on his own! It was a "many fish" day! I was hooked for life. Crappies have a special place in my heart! I had a similar thrill last August as I tried this new type of fishing called Tenkara. I read a book. I bought a rod, line, and three "tenkara" flies. 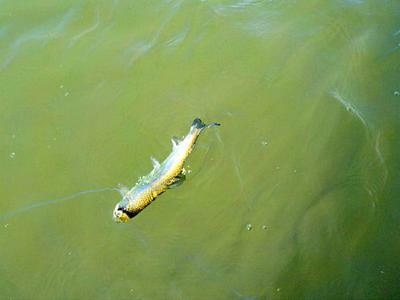 I cast upstream to a pocket in Stanley Creek and caught a nice cutthroat trout. John if you ever make it out to Idaho, I can get you into some wild rainbows! A great story, with a moral. John, that is a great story, and as with most great stories, it has a moral. In this case, the moral of the story is that a kid really wants to catch a fish. An adult may just enjoy being out in nature, but to a five year old, the point of fishing is to catch a fish. If it takes a worm, use a worm (or a Mummy Worm). You might want your kid to be a fly fisherman, but if that first outing is a source of frustration rather than joy, your kid may not be interested in a second outing. The joy and excitement from that one fish made John a fisherman for life. If your kid catches fish and likes fishing, there will be plenty of time to introduce him or her to fly fishing. Well, fellows, you made my day. I suspect that most anglers have a similar-type story buried somewhere in their background. Les, I really appreciate the offer. The itch to travel north grows stronger! Chris, you're right. I can't tell you how many times in urban fishing spots that I've had children with their parents ask me, "Mister, can I touch that fish?" They want to see and handle that fish! I always says, "If it's okay with Momma & Daddy, it's okay with me. You should get your parents to bring a pole along with you next time!" Wow, Everything you guys wrote brought back some good memories. I remember vividly losing the first trout that I hooked at around six years of age while fishing for sunfish at a place my dad took us often. I have loved fishing ever since that day! Thanks for the memories! Pass it on! Mike W.
Thanks for that wonderful story John. I remember fishing with my grandfather at 4 years old. It was a pond somewhere near Wichita Falls, TX. We each had two bamboo poles set out with string line and bobbers. A small shower came up. As soon as the rain stopped all four poles started dancing and stayed that way as fast as we could land the fish and rebait the hooks. We filled a burlap bag with catfish and had a wonderful catfish dinner that night. Tenkara pond fishing has taken me back to that day, 60+ years ago, many times since. God Bless all the children, young and old!